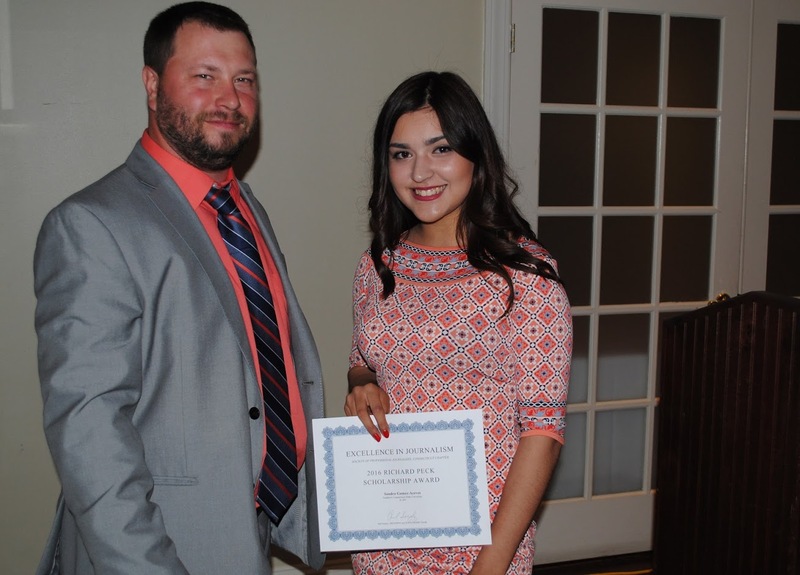 The Bob Eddy Scholarship Foundation awarded $6,000 in scholarship to four deserving students at the Excellence in Journalism Awards banquet May 26. To qualify for a scholarship, students must start their junior or senior year in Fall 2016 and be enrolled at an accredited university in Connecticut, or be a Connecticut resident enrolled in an accredited university in any state or country. The scholarship committee looks at past journalism work, commitment to the industry, academic success and financial need when determining winners of the scholarships each year. 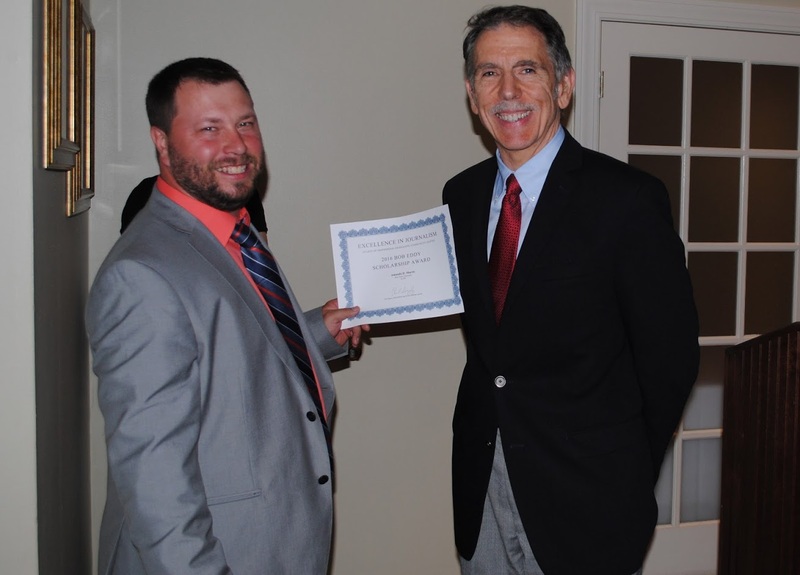 The Bob Eddy Scholarship Foundation is managed through the Community Foundation for Greater New Haven. To donate to the scholarship fund, please click here. 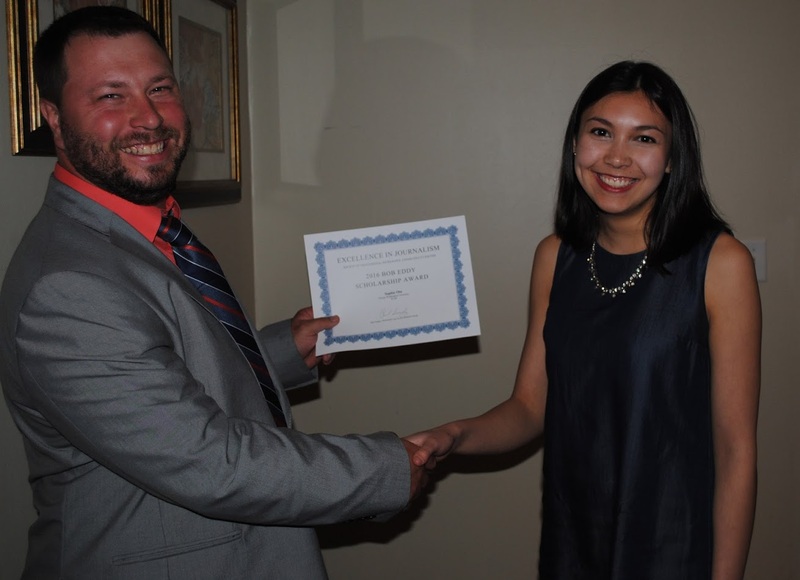 CTSPJ President Paul Singley, left, with Sophie Ota, Bob Eddy Scholarship winner. Sophie Jane Ota (Bob Eddy Award — $2,500), a Redding, Connecticut native, is a rising junior at George Washington University, where she is a reporter for her campus radio station, WRGW District Radio. She has interned at The Redding Pilot, the U.S. Department of Education, and the U.S. Senate Committee on Health, Education, Labor and Pensions. She will be interning in D.C. this summer at the Fairfax County Democratic Committee and the Vietnam Veterans Memorial Fund. She received the 2015 Phillip L. Graham Diversity in Journalism Award and the 2016 Sherman Page Allen Excellence in Journalism Award through her journalism department. Sophie aspires to become a political reporter. CTSPJ President Paul Singley, left, with Amanda Morris’s father, who accepted the Bob Eddy Scholarship award on her behalf while she is traveling in Europe. Amanda D. Morris (Bob Eddy Award – $1,500), of Farmington, Connecticut, will be a junior at New York University, double majoring in Journalism and Media, Culture and Communications. Her aspiration is to be a humanitarian journalist who covers global issues. She has experience in print, radio and broadcast journalism, including internships at Scholastic News, Prague.tv/Prague Daily Monitor, and a summer internship planned for the Republican-American in Waterbury. 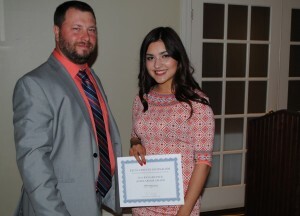 CTSPJ President Paul Singley, left, with Richard Peck Scholarship winner Sandra Gomez-Aceves. 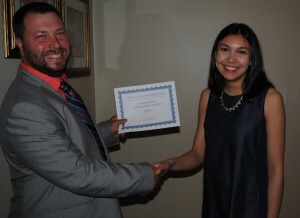 Sandra Gomez-Aceves (Richard Peck Award – $1,000) is a junior at Southern Connecticut State University from Meriden, Connecticut. She is the news director for the campus television station, SCSU TV, and has completed an internship at the Meriden Record-Journal. She will start an internship at the Hartford Courant this summer. She is working toward a career in broadcast journalism, and would like to one day work at Univision. 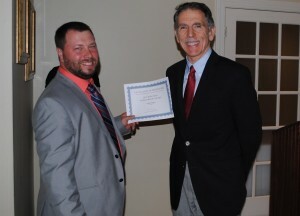 CTSPJ President Paul Singley, left, with scholarship winner John Napolitano. 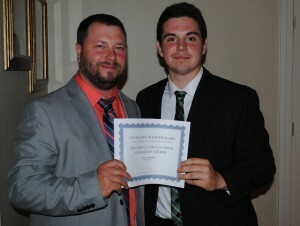 John V. Napolitano (James Clark/Pat Child Award – $1,000) ) is a sophomore journalism major at Hofstra University from Hamden, Connecticut. He is a member of the news and sports departments at WRHU 88.7, two-time recipient of the Princeton Review’s number one college radio station. He is a staff writer for the Hofstra Chronicle, the university’s weekly print publication. Napolitano works in the Dean’s Office at the Lawrence Herbert School of Communication. After school, he has aspirations of working in the sports broadcasting field. 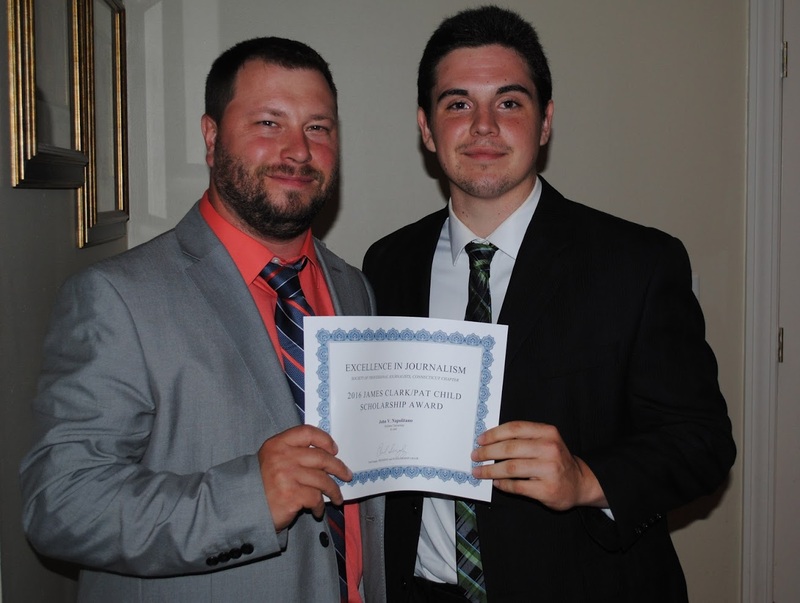 The Connecticut SPJ Excellence in Journalism dinner was held on Thursday, May 26, 2016 at Seasons at the Tradition in Wallingford. The CTSPJ board announces winners of the 2015 Excellence in Journalism Contest, as well as the recipients of the board’s annual scholarship, at the dinner. The board also inducts new members into the Connecticut Journalism Hall of Fame and honors those who have fought for open government during the event. The dinner is the largest gathering of journalists in Connecticut each year.